How is the lookup done in Resource table? How is Enqueue operations works? Enqueue are locks which serialize the operations to the shared structure. 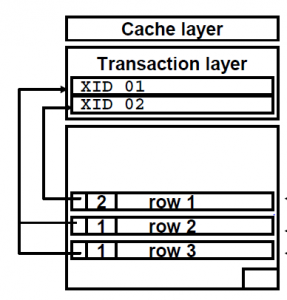 The shared structure could be table, redo threads and transactions. When a user A updates a row 12 in the table, it acquires the transaction Enqueue (lock). This is acquired so that Any user which I trying to update that same row 12 in the table will wait until the user A commit the transaction. So now if user B tries to update the same row, it will wait on the enqueue. 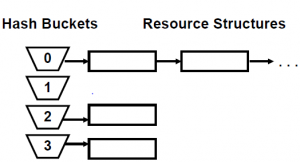 When a user requests a lock on resource in certain mode, it obtained a lock structure and it makes a request to acquire the lock on certain resource.it is the placed in these lists of the resource structure as per the lock required. The resource table contains all the resource structure. A hashing algorithm is used to find and access the resource structure in the resource table. The resource table is arranged in hash bucket. Each hash bucket contains a list of resource structure in linked list form. Converter is always processed before the waiters. Oracle server checks these queues every time lock is released or converted. Processes waiting for the resources sleep on the semaphores, and semaphores are used as sleep/wake-up mechanisms. After enqueueing in to the queue, the requesting process will sleep on the semaphore using the sync_op call. JQ – Job Queue. When a job (submitted by DBMS_JOB.SUBMIT) is running, it is protected by a JQ enqueue (which means that only one SNP-process can run the job). ST – Space management Transaction. The ST enqueue is need to be held every time the session is allocating/de-allocating extents (which means wants to change the UET$ and FET$ dictionary tables), like coalescing, drop/truncate segments and disk -sorting. If the session gets a timeout when requesting the ST enqueue, “ORA-1575 timeout waiting for space management” is returned. 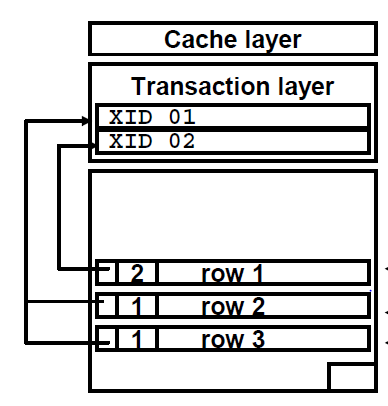 TM – DML (Table) enqueue. Every time a session wants to lock a table, a TM enqueue is requested. If a session deletes a row in the parent-table (DEPT) and a referential constraint (foreign key) is created without an index on the child-table (EMP), or if the session is updating the column(s) that the foreign key references to then a share lock (level 4) is taken on the child table. If another session tries to do changes to the child-table they have to wait (because they want the enqueue in row exclusive mode, and that is not compatible with the share mode). If an index is created on the child-table’s foreign key-column, then no share- lock is required on the child-table. 1) Another session is locking the requested row. 2) When two sessions tries to insert the same unique key into a table (none of them has done a COMMIT), then the last session is waiting for the first one to COMMIT or ROLLBACK. 3) There are no free ITL (Interested Transaction List) in the block header (increase INI_TRANS och PCT_FREE for the segment). UL – User Lock. A session has taken a lock with the DBMS_LOCK.REQUEST Function. DML Table Lock: To ensure object definition consistency for the duration of the transaction. This prevents any DDL operations to occur while a DML is in progress. Each cursor maintains a list of table lock structure which is built while parsing the statement. Upon the first execution, function call is made to lock all the table in the list. The locks are released when the transaction commits or rollback. The possibility of rollback, particularly rollback to a save point, adds another dimension of complexity to dictionary locking. Namely, if a transaction is rolled back beyond the point at which a lock was upgraded, then the lock must be downgraded correspondingly, as part of the rollback operation, in order to reduce the risk of artificial deadlocks. The requirements of dictionary locking for transactions and, in particular, the maintenance of a history of lock conversions, are provided by DML locks in conjunction with TM enqueue. Every transaction holding a DML lock also holds a TM enqueue lock. The basic locking functionality is provided by the enqueue, and the DML lock adds the maintenance of the conversion history. The fixed array of DML lock structures is sized by the DML_LOCKS parameter. Its free list is protected by the dml lock allocation latch, and the active slots are visible in V$LOCKED_OBJECT . How to disable the table locks? DML locks and the associated TM enqueue locks can be disabled, either entirely, or just for certain tables. To disable these locks entirely, the DML_LOCKS parameter must be set to zero. In a parallel server database, it must be set to zero in all instances. To disable such locks against a particular table, the DISABLE TABLE LOCKS clause of the ALTER TABLE statement must be used. If locks are disabled for a table, then DML statements can still modify the table’s blocks, and row-level locks are still held. However, the sub-shared mode table locks normally associated with queries, and the sub-exclusive mode table locks normally associated with DML, are not taken. Instead, transactions against the table are protected from conflicting DDL by simply prohibiting all attempts to take a lock on the entire table, and thus all DDL against the table. Disabling the table locks can increase performance as lock acquisition overhead is reduce This is more particularly important in case of RAC where this overhead is quite high. A ITL clean-out means to look for the XID in the ITL and search the rollback segments based on this and look the for the transaction table and wrap number to check for the transaction activeness. The first DML in a session where a transaction does not already exist will implicitly create a transaction.